Total Access Analyzer Version X.9 is not the latest version. Version X.95 was released in 2015 with many new features. FMS is pleased to provide a major update to Total Access Analyzer for Microsoft Access 2007 and 2003. Total Access Analyzer is the world's most popular Access product. The X.9 versions of Total Access Analyzer include many new features and enhancements to help you create and maintain Microsoft Access databases better than ever! These new versions are now available. If you have the Access 2003 version prior to version 11.8, click here to see the features that were added in 11.8, which are also part of the 11.9 version. Total Access Analyzer X.9 builds on its heritage of helping Access enthusiasts create better Access solutions with a wide range of new features. We've added many enhancements based on our experiences, the recommendations of our customers, and in conjunction with our release of the Access 2010 version. A new performance tip identifies queries that may benefit from fewer Group By levels. Queries with GROUP BY clauses take longer to process. Queries with Group By clauses based on other queries with Group By clauses may perform better if the grouping were only done at the final level. This depends on the question being asked and may not work if there's a need for the unique group as part of an earlier query. However, if that's not needed, performance differences may be considerable. We suggest using the Execute command to run action queries. The list of SQL Server reserved words is updated for SQL Server 2012 along with the new list of anticipated future reserved words. We suggest setting this option so users are not confused by truncated numbers. 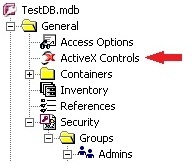 This makes it easy to see the types of ActiveX controls used in the database and where they are used. This does not appear if there are no ActiveX controls in your database. 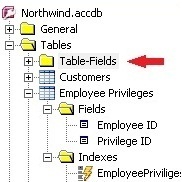 The new Table-Fields folder lists the fields across all the tables. This makes it easy to filter and sort field names and types across all your tables. The Explorer has many tabs which vary based on the selected folder or object in the treeview. To make it easier to know what’s available, the captions change to better describe what's available. For tabs that never have data to display, the captions are blank. For modules, when viewing the Module XREF tab, pressing the Design button now opens the referencing (parent) object. Previously, it was opening the called object which can still be opened from the other tabs, but the XREF opens the calling side which makes it more convenient to see where your code is used. Previously, only one report could be previewed or opened in report view. Now, multiple reports can be opened simultaneously so you can see more reports at once. The only exception is when the same report is used with different filters where only one instance of that report can be opened at a time. Colors can be applied to sections of the report under Report Options. Text and background colors can be selected for the title, sub-title, headers, footer, and group shading. Many of the existing reports were modified to show where conditionals are used. 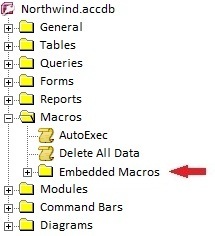 For regular and embedded macros, the macro action is moved to the top of the line and bolded, followed by each of its argument labels and values, similar to the way it appears in the macro editor. IF..ELSE..END IF blocks are indented. There are two macro dictionary reports now. One has a page break between every macro, and the other doesn't. Previously, all modules needed to be selected for Module XREF to be performed. The new version lets you choose a subset of modules for faster processing. The code analysis may be incomplete if important modules are not included. If some modules are not selected, a warning message appears, but you can now proceed at your own risk. Duplicate definitions of constants, variables, declare statements, user defined types, enum, procedures, and other constructs are properly documented and handled for the code analysis. Conditionals are displayed in many of the module XREF documentation views and reports. A new Compiler Conditions item is added. Macro lines are documented including IF..ELSE..END IF structures. The Macro Dictionary Report now shows your macro lines with syntax indentation. Macro actions with missing arguments are errors that will crash when the macro line is executed. Total Access Analyzer flags these errors so you can catch them before deployment. Missing arguments for RunMenuCommand items are also identified. 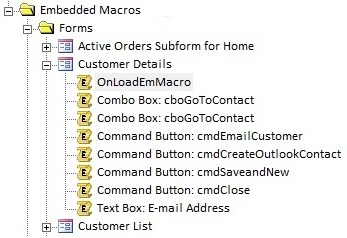 By selecting an item, the corresponding macro code is displayed. Temporary variables were introduced in Access 2007. They let you create variables in macros and modules that can be referenced by other objects such as queries using the TempVars! [VariableName] syntax. This is easy to do but challenging to manage. New features help you know where they are defined, where they are used, and problems that exist. Four new temporary variable reports are available under Database and Module XREF to see the list of temporary variables that are defined and where they are referenced. 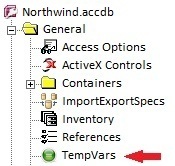 Temporary variable cross-referencing is performed to detect errors where TempVars are referenced but never created. A new suggestion flags unused TempVars. Temporary variables that are created but never referenced. The look and feel of the add-in supports Office themes and other appearances expected in a modern Access application. Maximized forms and tabbed document support are used where appropriate to display as much data as possible. While Total Access Analyzer is performing database documentation, it can now be minimized. Total Access Analyzer respects your Windows login rights. By default, it is installed in your user folder, it updates registry settings in your user section and anticipates the issues around user access control and trusted folders. The setup program has an option to install it for the entire machine. This makes it easy for administrators to install it on a machine and allow other users with lower rights to use it. Total Access Analyzer X.9 supports Windows 7 in addition to Windows XP and Vista. If your version of Access supports the operating system, Total Access Analyzer X.9 does too. That also includes all Access database formats your version supports. Due to the different features in each Access version, Total Access Analyzer has a separate versions corresponding to each version of Microsoft Access.